Radiation Protection Products, Inc. (RPP) worked on a unique project for the US Department of Energy in Morgantown, West Virginia. The DOE's National Energy Technology Laboratory needed a one-of-a-kind, oversized radiation shielding sliding vault door. The door measured 10'3" by 10'9" and required 1" thick lead shielding. RPP faced several challenges in the construction of such a huge vault door. The outer plates on the door required that multiple sheets of steel be welded together, and additional processing was required to make these multiple sheets look like a single, solid piece. Due to the massive size of the door, a special crate on casters had to be built in order to effectively transport the door shell. The final setup of the radiation shielding door also necessitated special lead lined steel tubes to fill the gaps between the door header and jams. 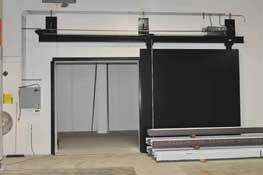 As with all of Radiation Protection Products' sliding door installations, light curtains were added on either side to protect personnel from injury when the door is opening or closing. RPP also supplied interlocking lead bricks for the ceiling of the vault, which were installed by the project's primary contractor at a later date. Working at the Department of Energy's secure location was not an issue for Radiation Protection Products' installation crew. To ensure security, the RPP team was under constant supervision, but they were easily able to complete the installation process time for the project's deadlines. Despite the extreme size of the sliding vault door Radiation Protection Products needed to manufacture, and the unusual setting and working conditions, the quality of the company's performance was not affected. They delivered a superior product and outstanding service to meet the needs of a very exacting client. The radiation shielding vault door installation project at the National Energy Technology Lab was completed in August 2010.